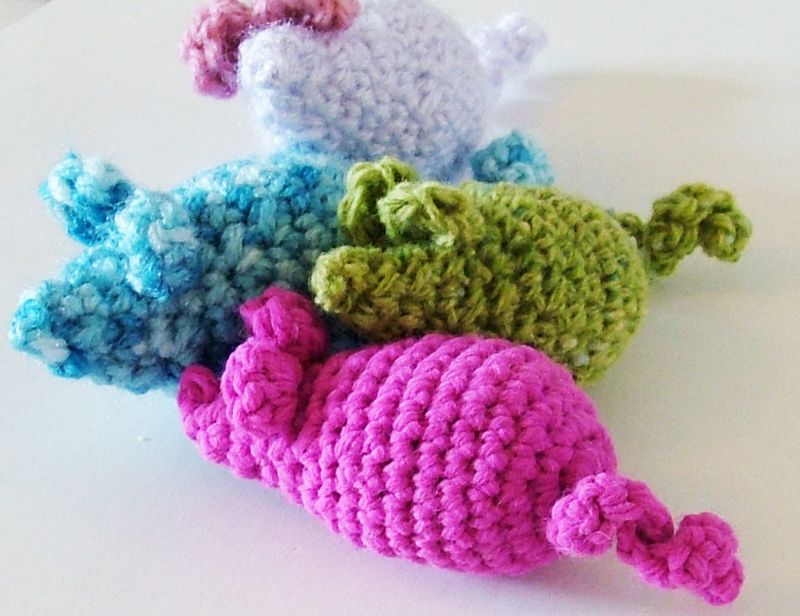 Small amount of scrap acrylic yarn, small amount of catnip, 3.5mm crochet hook, some stuffing, Jingley bell (optional). Row 1: sc in 2nd st from hook and continue till the end. This will make the tail. Row 8: sc in first 5 sc, sc next two sts tog. Repeat until you can just snugly fit your index finger into the top of the mouse. Stuff with catnip and stuffing (and bell). *next we add the ears. Get another colour of yarn, join it to the outer lip of one sc, as we will use the inner lip to complete the mouse. Ch 2, then in the same sc make 2 dc, sl st in same sc lip. Next, sl st in the outer lip of the next stitch, and the one after. Next, ch 2, 2dc and sl st. tie and cut off. Row 9: Continue with sc in 1st sc, sc next 2 sts tog, until you only have 7 sts around left. After which just sc next 2 sts tog until you are left with about 3 sts. Leave a 3 inch tail of yarn to seal and secure. Weave in any loose ends into the mouse, et voilá!!! You have a catnip mouse! Recipe for a happy tummy! I know I had promised a new post by Friday but my internet was down so I apologise for that! Onto today’s post, as I mentioned before, baby Guinness eats only wholesome, hearty, homecooked meals. I feel this way I know exactly what goes into his oh so topsy-turvy tummy. At only seven months of age, it is crucial a kitten’s food contains the essential nutrients to help him grow. This recipe can also be used with adult cats. Although I wouldnt change it,’you can cut out the milk powder if u like. So here’s the recipe I’d use normally… you can substitute the meat for chicken too! 1. Boil the minced beef in a pot of water for about 25 mins. Drain. Save the water! You will need it in the next step! 2. Use the water from step 1 to boil the pasta until its just overcooked. It needs to be a bit mushy. 3. Off the heat, add the pre-boiled minced meat to the pasta, mix, then mush it up like mad with a potato masher!! Add the milk paste and crushed egg shells to the mixture. 4. Next, add the oil to a pan over low heat and add the vegetables. Once the vegetables have softened slightly add them to the other ingredients. Guess what comes next?? You guessed it!! MUSHY MASH MUSH MASHY!!!! 5. DONE. This recipe should be enough to last about 12 servings. I separate the mix and put it into disposable pudding cups and bung them into the freezer! The trick is to defrost one in the fridge one day in advance. *Crushed eggshells = Wash and dry 3 eggshells, put them in the oven at 190 degrees celcius for about 20 minutes or until bone dry. Using a pestle and mortar crush the eggshells into a fine powder. As mentioned in the previous post, you can add a couple of tablespoons of brewers yeast to the food once its defrosted. I use one tablespoon per serving, twice a day! (duh) Also, if you like, you can add 2 tablespoons of codliver oil to the recipe after the finished mixture has cooled down slightly. Codliver oil is rich in vitamin D which is great for growing bones! But please don’t try to be over-enthusiastic and add too much, it can be dangerous! You put your kitty at risk of vitamin A toxicity as codliver oil is rich in vitamin A too! RESULT: Well… just see for yourself!